New Delhi, April 17: With former Union minister and senior Bharatiya Janata Party leader Uma Bharati taking a jibe at Congress general secretary Priyanka Gandhi, Robert Vadra, on the other hand, had stated that if contested, Gandhi would pose a strong challenge to PM Narendra Modi in the Lok Sabha Elections 2019. 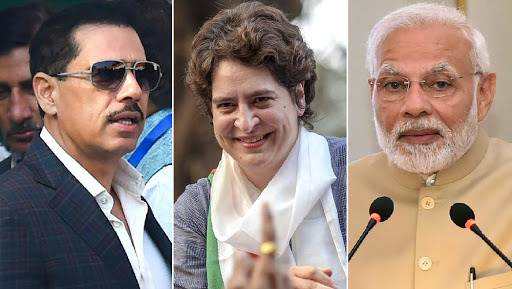 Expressing his opinion on Priyanka Gandhi, if being fielded from Varanasi against Prime Minister Narendra Modi, Vadra said, as reported by TOI, "She will work hard. People want change and they see it in her and Rahul Gandhi." Asked if she would be a tough challenge to PM Modi, Vadra said, 'Of course'. Lok Sabha Elections 2019: No Decision Yet on Priyanka Gandhi Vadra Contesting from Varanasi, Says Congress Leader Rajeev Shukla. Though there is no official confirmation whether Gandhi would be contesting from Varanasi or not, she had reiterated that she is ready to contest provided the party wants her to do so. Even it is stated the political arena, SP-BSP combine is willing to support Priyanka Gandhi, if she contests against Narendra Modi in Varanasi. Earlier, making controversial comments on Priyanka Gandhi, Bharati had earlier accused her of being a thief's wife. Asked if Gandhi can influence the voters, she had said, "Nothing. Someone whose husband is accused of being a thief, how will they be judged? They will be judged teh way country looks at the wife of a thief."